(boys XL wmns XS) Vintage RALPH LAUREN Pullover-style Military Jacket! Cool Patches! 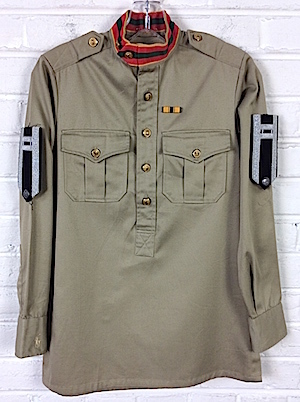 Home > Items just added 4/3-4/17 > (boys XL wmns XS) Vintage RALPH LAUREN Pullover-style Military Jacket! Cool Patches! 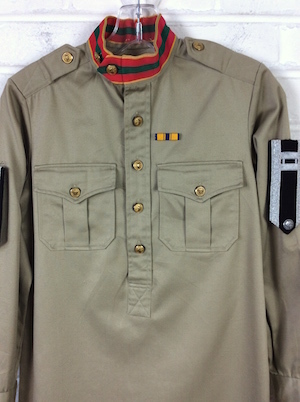 Vintage Ralph Lauren Pullover-Style Military Jacket! 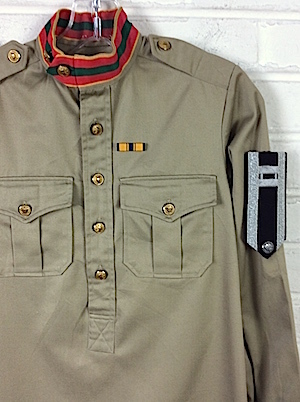 Khaki base with Silver and Black Air Force shoulder-boards on each arm, a little Yellow and Blue patch on the chest and Red, Green and Gold along the collar. There are Golden metal buttons on the epaulets with burnished Silver buttons on the shoulder-boards. Regal and majestic, perfect for your Halloweeny shenanigans! Four Golden metal buttons down the front with two more on each cuff. Gold button closure patch pockets on each chest, and there are little button tabs on the side vents for style and comfort. Nehru style collar with a straight hem and there is a little embroidered polo symbol on the left cuff. Tagged by Ralph Lauren. 50/50 Poly/Cotton. Sleeves: 27.5" collar to cuff / 22.5" shoulder seam to cuff, Please note shorter sleeves.